As bloggers, photos are so important to what we do and how we express ourselves, so it's always great to learn more about how to become a better photographer. To celebrate the grand opening of George's Camera on Clairemont Mesa Boulevard, The Tamron Tailgate Tour will be stopping by for a "Fun Educational Photo Experience", which includes FREE photography mini-sessions, answering all of your photography questions, test driving new products, and a luncheon on the first day of the stop. Here is a schedule of events, which looks to be fun and informative. Cheers! 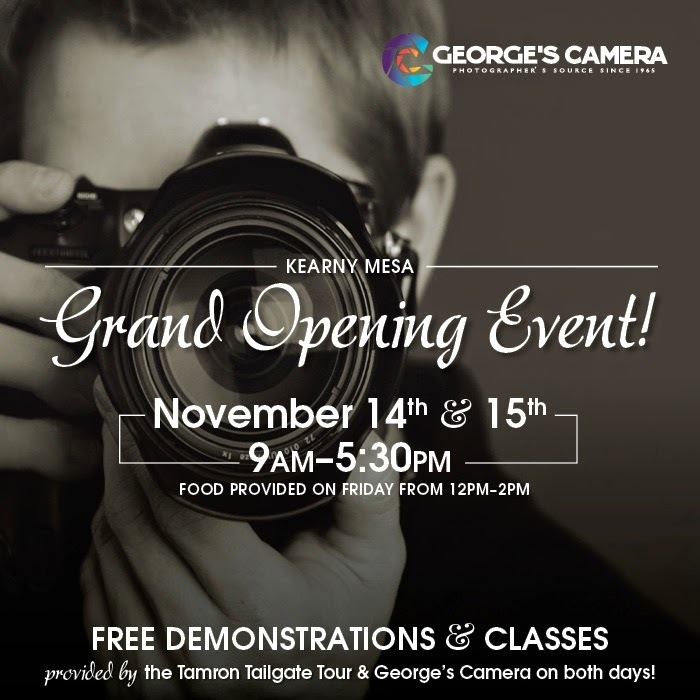 Friday, November 14, the Tamron Tailgate Tour will be stopping in San Diego to provide guests with fun photography training and a tailgate lunch. Participants can get answers from experts and try out the latest Tamron technology. Amateurs, hobbyists and professionals are welcome. Saturday, November 15, camera manufacturers will have representatives on site. Free classes will be ongoing from 9 a.m. to 5:30 p.m., as well as various photo booths for guests to get behind and in front of the camera.